As I look through FORIX, I see that a driver named Stefano Modena was very impresive during his short F1 career. A second place as his best ever, and he quaified on the front row for Monaco in 1991 with the Tyrrell. He also scored a point in his final GP in 1993. Why did no one ever take him on? Just from these results, he looked like a really good driver. I didn't care about F1 at that point in time; however, from what I know, he was supposed to be one of F1's "Next Big Thing"s with Tyrrell, but disappointed with Tyrrell--they expected him to at least win a race with the machinery he had (Honda power--enough said). I have a Grand Prix Manager game demo (not the Microprose game) where he eventually went on to become a WDC a few times, so he was obviously in high regard in F1 circles. Physcoman, is that the GP manager game set in the 91 season? Is it a DOS game? Does it have no graphics what so ever? If it fits that description (i've forgotten what it's called), then it is probably the game i was hooked on a few years ago. My HDD crashed and i lost that game forever. It had very basic gameplay, and at one stage i had every pole position (Alesi being my driver) for about 5 years. Does that sound like your game? If it is, please let me know, because i'd love to play it again! BINGO!!! Here is the download for the demo--which I cannot seem to get to the point where I have to pay $8 for it They then made a sequel, which is a bit better. It has actual graphics (flashing screen maps), real sponsors, 20 tracks and only 16 spots to fill, and computer teams that go bankrupt! However, the full version is $15 (form at www.wizardgames.com ) and only goes 1 season before you have to start paying for it. Still, like you said, very addictive... Biedaway, it's called simply "Grand Prix Manager"
Thankyou Psychoman!!!!! Now i can be a recluse for a day and play this game forever!!! BTW, who needs to save a game when i can just slip my Notebook into standby? Uh....glad I could help guys. I am new visitor to the BB and am very impressed by the information contained in it. Here is some information about Stefano Modena. Racing in Formula 3 and Formula 3000 in the mid-eighties he was marked out as a special talent becoming F3000 champion in 1987, and at the Australian GP had a one-off drive with Brabham. For 1988 he spent the season with the new EuroBrun F1 team, but the cars were very uncompetitive and his best finish was 11th at the Hungarian GP. He moved to Brabham for 1989 and finished an impressive 3rd at Monaco. His two seasons with Brabham saw him finsh only 12 races with his only points finished that 3rd place at Monaco and a 5th place at Phoenix in 1990. Still regarded as a 'future prospect' he moved to the Tyrrell team in 1991, complete with Honda engines, and in the first half of the season had some good races, regularly qualifying in the top ten (including a front row start at Monaco), and finshing second in the Canadian Grand Prix. For 1992 he moved to the Jordan team, and this is where it all went wrong for Stefano. The Yamaha engine wasn't very powerful and he failed to qualify for four of the races and his best finishes were a 7th & a 6th in the final two races of his F1 career. So that was Formula 1 finished for him, as he joined many other 1992 F1 drivers on the sidelines in 1993. For that season Stefano raced in the Italian Superturismo. In 1994 he made his debut in the German Touring Car Championship at Avus, and won both races! He raced in the International Touring Car Championship in 1995-1996 and since that championship collapsed he has been racing in the German Super Touring Car Cup with Alfa Romeo. May I revive this old thread? I'm so curious to find out more about Stefano Modena! In this test there were no Ferrari, but I add here because it's interesting for young drivers test. Modena tested a F.1 for the first time (one week later he raced his first GP on second Brabham at Adelaide), while Herbert had already driven Benetton at Brands Hatch (when?) and Jerez (see above). Nannini and Modena used their own helmet, and Benetton had neither drivers name nor white line above 'ON' (Benetton) letters. By the way, Sala was at his second F.1 test; previous one was at Estoril with a Zakspeed. For 1988, Modena signed for the new EuroBrun team. Did he have other options? I seem to remember that he was a candidate for the second Benetton seat, but the team eventually chose Nannini. According to a post in the Almost moves thread, he was on the virge of signing for Arrows for 1990. Can anyone confirm this? When Alex Caffi was injured at the start of 1990, Bernd Schneider drove the Footwork at Phoenix, but Stefano Modena - contracted to Brabham, who were in financial difficulty - also tested. Caffi was fit for Brazil, but Autosport had a pic of various decals of drivers' names the Footwork team had on hand there, which suggested that Schneider, Modena, Stefan Johansson and Enrico Bertaggia were considered as reserves just in case. He's a driver that's always intrigued me as well. What I noticed, whenever I watch the F1 season review videos, is he invariably appears to have a 'pissed off' look about his features. There's a rather exasperated air about him in contemporary interviews of the "What else can go wrong for me today?" style. I think his Tyrrell performances weren't too bad considering just how heavy that Honda engine was, and he was intermittently very good in the Brabham, but he just didn't seem to take racing terribly seriously; he arrived in F1 at about the time that it became total warfare rather than gentlemanly combat, and I don't think he was cut out for that kind of environment. Gorgeous wife though, wasn't she a Princess? Murray Walker once read out a letter from an Irish viewer, which said that he was glad to hear that a fellow countryman had made it to F1: Stefan O’Modena. At the time it sounded like a genuine letter, and Murray put him straight, but I wonder now. Modena was one of the most overrated F3000 champions - another would have been Erik Comas. Modena never had the mental toughness that drivers need when things aren't going too well. For me it was one of the injustices of 1992 that it was Modena that scored Jordan's solitary point rather than Gugelmin who put his head down, did the hard yards, and qualified for every race, helping boost morale in a sagging team. I think this aspect of Modena, his lack of commitment to his team's cause when race performances drop off, was noticed to a certain extent at Tyrell the previous year. It seems Ken was glad to see him go. The others said his motivation had vanished after he heard that Capelli stole "his" seat from Ferrari for 1992. I'd say that he was exited to get Jordan seat. As we know 1992 was a disaster for Jordan but I wouldn't say that it was that because of Mauricio and Stefano! They both were very experienced and fast drivers, trying to take the final step to regular podium finishes, so no lack of motivation there. Maybe in the mid season they were frustrated but still motivated for keep the team managers’ interests up for next season seats. So, in my point of view I can't understand why EJ changed Mauricio and Stefano to Rubens and Ivan? Ok, Jordan might have had hole in a budget and Rubens was welcomed with his Arisco money but Ivan Capelli? EJ must have been blind or something? Capelli's year at Ferrari was much worse than Jordan's own expedition with Yamaha. So, I must admit that Capelli's contract to Jordan shocked me. I'd have gone to Mauricio or Stefano. At least I can't understand how they both didn't get contracts to F1 for 1993 as everyone knew poor results were mainly because of the Yamaha.. Yes, by the name of Sveva - and she was (and I'm sure still is) as pleasant a person to be win the company of as she was pleasing on the eye. Regarding Jordan... it was all about money in those early days, and nowt else. Wasn't Stefano one of those drivers with a very obsessive way of going about his pre-drive ritual? It ran something like this - and this is from a half remembered conversation about 15 years ago so its far from gospel - Put on the left sock first, tie up the right boot before the left one, stand on the right of the car while you put your crash helmet on and put your left had on the roll hoop before touching anything else on the car... etc etc. I was once told he couldn't bare being touched by anything or anyone while in this routine and if a crew member grabbed the belts and touched his shoulder before a certain point had been reached, he got back out of the car and started again! I vividly recall him squatting down in the corner of the Brabham pit at a test in 1990 and having the 1000 yard stare while several people tried and failed to talk to him. I asked for an autograph and his arms moved, he took the book from me without looking and signed it then handed it back again without looking and still he had this fixed stare all the while. I got the impression that it was all done by reflex rather than concious decision making and I bet he never realised I was there.... it was an odd encounter. Nigel Roebuck told the story in Fifth Column that Keke Rosberg dismissed Modena as a talent following his debut GP - "forget him, he'll never make it, he retired from his first GP because he was tired? If you're making your GP debut you carry the bloody thing home" or words to that effect. There was the other superstitions about him as well - an inside-out glove (which he claimed was because the lining itched), and didn't he have different coloured boots? Where have you been hiding? I hope you are doing well. Regarding Modena, he was touted as a rising star in F1, but he didn't fufill those expectations. I believe he won the F3000 championship in '87, and then made his F1 debut w/ Brabham in Adelaide that year. I remember very well his campaign in '91 w/ Tyrrell. He had some impressive performances, but it seemed like he quietly faded away. He was also a karting ace and raced against the likes of Senna in the early '80s. edit: I just noticed when this thread was initially started. Am I late to this, or what? didn't he have different coloured boots? I think I remember that he always had one red and one green boot. Presumably he therefore always had a similar pair at home! and didn't he have different coloured boots? Alex Wurz suffers from the same affliction. Wurz got out of that habit when he went to McLaren. Think he's still wearing matching boots at Williams - well he is in the launch photos anyway. I think Modena had to operate out of a certain side of the garage as well - the left-hand side, IIRC. Brundle tells the story in 'Working The Wheel' of the Brabham guys having to swap everything over just before practice somewhere because Modena's car was on the right-hand side and he refused to get in it! Martin Brundle too made some remark about how Modena was incredibly quick, but it became apparent early on when they partnered each other at Brabham that he lacked the mental toughness or the intelligence to really succeed as an F1 driver. He was great when the car was quick enough for him to do something with it, but if the car wasn't there he lost interest too easily. Having said all that, none of his fellow 1987 F3000 front runners ever really amounted to much in F1 - Roberto Moreno looked quick until he got a really quick team mate at Benetton in 1991, at which point his limitations were revealed all too clearly. Dalmas, Perez Sala, Julian Bailey and Gabriele Tarquini never quite cut it in F1 either. I posted this in another forum one of these days, and got some answers, but I think I can get more answers here. I don't really understand what happened to Modena. From what I know (mostly through researching on stats websites), this was his career... first he impressed in the lower formulas and got into F3000 in no time, winning the championship in his debut year (87). Got a chance in F1 immediately the following year with the shitbox of Eurobrun and had no problem with team-mate Larrauri. Got promoted to Brabham the following year and had to face Brundle - did well in qualy there, but Martin was too much for him in the races. Got lucky with a podium in Monaco where Brundle had shined more but had to face technical problems. Still, that wasn't bad for an inexperienced driver and the next two years he shown lots of potential. Hammered David Brabham at Brabham the next year, and got his big chance with Tyrrell in 91 - where he shone exactly the same way as Alesi the previous year, outpacing Nakajima by an huge margin, and doing well in street circuits. Front row in the grid at Monaco, and a 2nd place in Montreal! This got him a place at Jordan who had just had a brilliant debut year in F1, but it turned out that instead of improving, the 1992 Jordan was really, really ****. Also, strangely, he got slightly outpaced by Gugelmin, despite winning the teams only point of the season. And then... he never raced a F1 again. This is what I can't understand. So he had a bad 92, but surely he had shown enough potential in the previous years for someone to give him a chance for 93? This was a time where F1 had lots of seats, and 94 would even have more as they just kept on opening up throughout the season. Was this a case of lack of sponsorship? Did he at least test for anyone? And why was he so poor in 92? Lack of motivation with having to face a poor car again? Car didn't suit his driving style? Just wasn't good enough? Stefano Modena today occassionaly works for Bridgestone, developing kart tyres. And, speaking of Karting, Modena was considered an exceptional talent in his karting days, quite obvious F1 material. Well, that's the problem with karting: it says a lot, but not all. Look at Wilson, Rossi or Fore. Same goes for other formulas as well, how many brilliant F3/F2/F5000/Indycar drivers have disappointed at the top level, unable to match other drivers whom they regularly outshone in the lower classes? The higher the class, the more sharply it seems to show up that 'edge' which separates the true greats from the merely brilliant. Sometimes it has worked in reverse; drivers who appeared fairly average before getting into F1 suddenly hit their stride and surprise everyone. Wilson did noty "disappoint" in cars: he simply did not have a shot at them, like Beggio. Danilo Rossi made wonders on a pitiful budget, winning a F3 race in an outdated chassis...and then ran out of money. Surely, if someone "did not get a shot" at cars it suggests that either the managers of car teams were not sufficiently impressed or that the individuals concerned did not want to race cars. Talent is one thing - mentality, opportunity, money, determination, will, ambiton and the ability to enthuse and motivate the people around you something else. The world is full of people who can claim they blew many current F1 drivers away in karts, but somewhere down the line other, crucial elements of the character play a decisive role in what gets people to F1, apart from money of course. This is actually not that uncommon. Indeed Senna got so used to driving with his gloves inside out, they started making them with the seams on the outside (and I think still do). And having tried them, when you have three layers of Nomex, they are quite a bit more comfortable. I always wondered how he (and Barbazza) got all that hair inside their crash helmets! I think I am truely lost for words! He doesn't like to be touched once he sits in the car, wears one glove inside out and won't sleep in a room with his feet facing the door! There’s an interesting article with Modena in the latest Motor Sport. In the end it seems that his character didn’t really fit in F1 or, perhaps, in any competitive sport. Reading between the lines it sounds like he was too introverted to really push his way to the top. There doesn’t seem to be much question over his natural speed though. Reading about his debut in Adelaide it does make Rosberg’s dismissal of him seen a bit arrogant. The step up to a turbo Brabham after one season of F3000 in 1987 was probably somewhat more demanding than going from F2 to a DFV powered Theodore ten seasons earlier. And one that at the very least would be utterly overlooked in F1, one of the most macho, sexist nd rather OTT sports. But it was out of time too, I think nowadays, if he had that kind of issue in his life it would be picked up at school maybe and he might have been taught how to deal with it and could have developed along nicely. But agreed, he seemed to need to be in his little box to get anywhere. When he was there, fine, but out of it was a bit out of his depth. I would imagine there are countless drivers who get lost to the sport at this level through mental health issues, it is something the world is only starting to understand but something I imagine motorsport will be very bad at acknowledging, being so testosterone fuelled and macho. The mental and human factor in the sport is precisely what attracts me most, I confess I am not properly interesting in mechanics bar the essential, nor am I a statistician. I like to analyse a career and the human side. I think Miranda that a lot of people do like that aspect too, The differences mentally between two great champions like Prost and Senna, why Mansell had to feel like everything was against him!! Why Schumacher was so hated by those elswhere but so adored and revered by those he worked with. But a case like Modena highlights the negative side of mental health, a clearly slightly troubled individual who with the right hep could have won races, and in this day and age I think he would be far better catered for in his early life. But is F1 even slightly aware of mental health issues? I am not so sure. It's a very macho and masculine world where that sort of things is always seen negatively. A very big deal in the UK at the moment, and with a lot of sports like rugby, football for latent damage from heading heavy balls. and in the media in general mental health is getting a lot of publicity here. Modena I think was not ill or unwell, but he seems to me to have tried to work in a field that was very tricky for someone with even slight issues. And let's face it the driver is the one most critical aspect of the team, so get him right and whoa. But you have to look also at the team owners, the fastidiousness of Bernie or Ron and others, the meticulous attention to detail that achieves nothing on track really but makes them feel better and everyone else has to cope with. All evidence of very minor but impactful mental health features. Edited by chunder27, 13 February 2017 - 12:19. Is Formula 1 (or motor racing in general) still considered "macho"? I think Modena could have some kind of these anxiety troubles due to his oversupertitious behaviours, which in anything diminidh his amazing feats!! 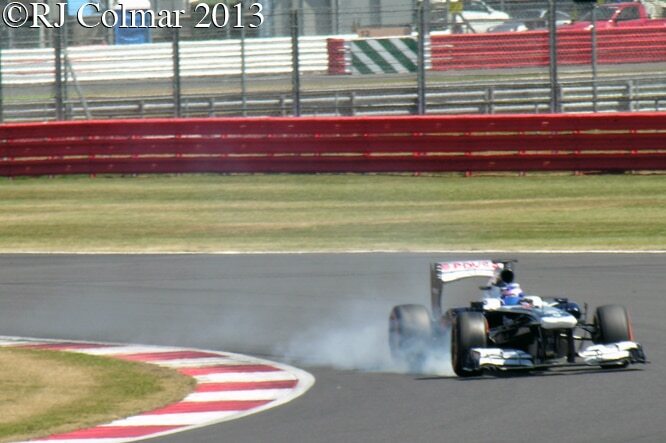 I wonder what Susie Wolff, seen above completing two race distances during testing a few years ago, thinks ? Damon Hill wrote about his depression at some length in his autobiography. I think at the very least if more drivers talked about the mental issues it could at least be more easy for them to get help or even admit to needing help. F1 is such a macho sport I can imagine if a driver has these problems it will stay very inward with his team, they all seem to have gurus and motivation coaches don't they?But it all likes looks like weakness which is a bit pathetic. But very real and true in motorsport, even more so in bikes where you can't even admit you are injured for fear of it handing a rival an advantage mentally. So, it is never likely to come out until someone retires! It is a very lonely sport for drivers though. Did Hakkinen retire coz he wasn't quick enough, did Nico retire because he wasn't quick enough? Neither, they retired because mentally they could not commit to that level anymore. And it took a lot out of them. Hunt could not justify the risks. Neither could Scheckter once he had won the main prize. Not an illness, but still shows the strain of trying to win at this level, and not everyone can do it for years, and those that are susceptible to mental frailty would no doubt suffer even more. Stefano Modena's Touring Car Career that followed from 1993 is equally bizarre. 93-94 were spent in the Italian Superturismo and seemed to have formed a close bond with the EuroTeam operation with whom he spent much of his touring car career. '93 was a write off but 3 wins followed in '94 along with a string of fastest laps. Then in '94, Modena got a call up from Alfa Corse for two DTM Rounds at Avus and Singen, then what happened next?........ BANG!!! Two wins at Avus!! Dominated the entire weekend and followed that up with a brace of 2nd place finishes at Singen! you honestly couldn't make it up. On the back of that was quickly signed for '95-'96..........and that was that!!! Over the seasons that followed those dizzy heights were never seen again '97-99 were spent languishing in the midfield of the STW Cup in ageing Alfa machinery, before one last season in the DTM in 2000 in a EuroTeam OPEL. Now happily working away as a test and development driver. witness this video on YouTube from last year, Tyre testing for Bridgestone in a Nissan Micra! !